For most of us the memory of last summer's smoke is as clear as the air was foul. I work outdoors, and like many people had no choice but to breathe the befouled air every day. One day in particular is etched in my memory. "Take my picture," said my wife Kim. Her voice was garbled, her words constrained by the rubber respirator mask she wore. She held a gorgeous cauliflower, dense, gleaming white, too big and heavy to sell at market without making jokes about cauliflower mortgages and interest rates. My wife, with this ideal version of a cauliflower in hand, stood alongside a lush field of vegetables, at our farm in Orchard Homes. Wildfire smoke bathed the scene in grey, ate the horizons, obliterated the mountains and literally colored everything in sight. At that very same moment Hurricane Harvey's biblical rains were pummeling Houston. 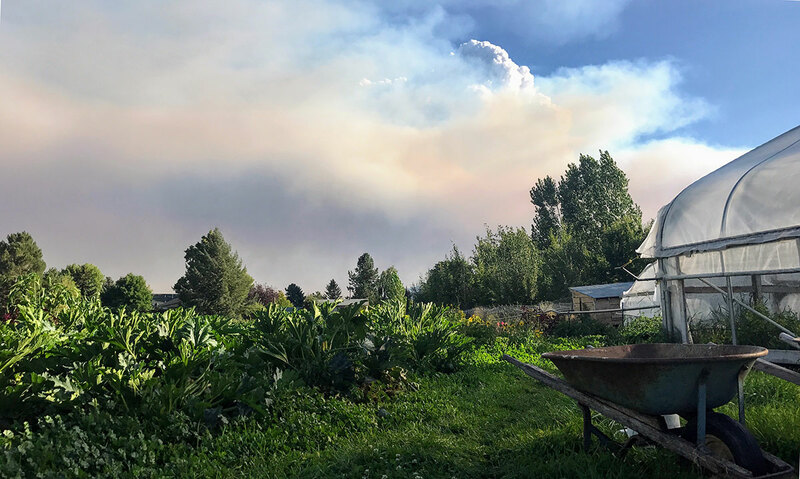 The Missoula City-County Health department made hourly designations of our air quality, moving along a scale between "Unhealthy", and "Hazardous". Seeley Lake evacuated that day -- not because of the flames, but because of the air -- or the lack of it. An exasperated health official said on the radio news at one point -- "It's so bad now we don't have a measure for it, it's about 35 times worse than Beijing on a bad day". The local news provided updates on percentages of fire containment, evacuation areas and event postponements -- valuable in-the-moment information, while the national media featured colorful stories of bass boat, rooftop rescues in Houston. 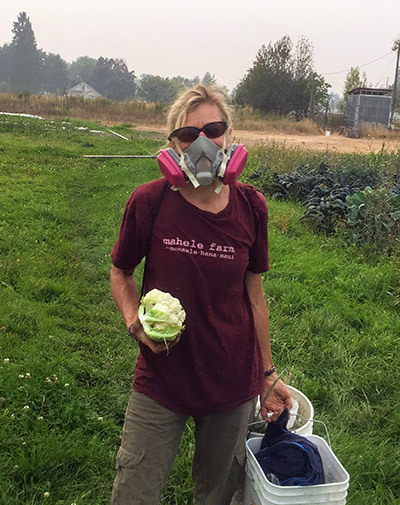 Our air blackened to Dickensian soot and in response, people did what they had to: farmers like my wife donned respirators to get out the harvest. These stories of resilience can work against us -- not just because of the health effects of breathing ashy air here, or wading through sewage streaked water in Houston -- rather our strength can blind us to the real call for action. Missing this call just guarantees more of the same. We must first shake our collective fists at the halls of power and proclaim that un-breathable air is not an acceptable, albeit variable, feature of the weather. Then, we need to get busy. 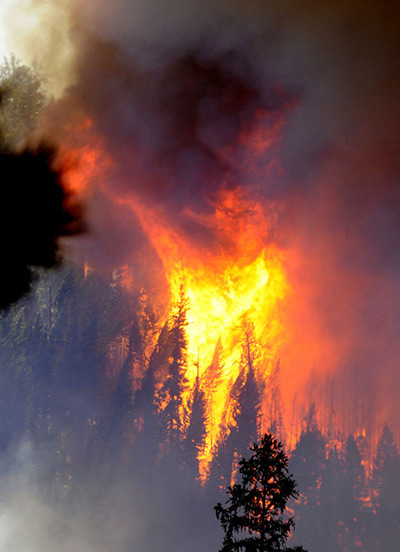 The storms and fires came as a one-two punch of climate and weather – fires are natural occurrences here for sure, just now, way, way, amped up. Scientists struggle with certainty and Republicans grandstand in the interest of party, but for us free of such constraints, the truth is clear. We have done this to ourselves and we need to stop. Fires will come. We can, however, work to limit their intensity, duration, and the danger to fire fighters and residents. Scientists have clearly stated that well thought-out thinning and prescribed burns, with forest ecology and fire management as our goals, can reduce the impacts of smoke. We need to have broad ranging conversations with all potential partners, including state and federal agencies to begin to do this work, and to pay for it. Additionally, we need to work clearly with fire professionals concerning new development in the urban/wildland interface. We must also make sure air filters are readily available wherever they are needed: schools, senior housing, health care facilities etc.